I must be getting old, because when I look at these Augmented Reality Lego, instead of thinking "cool! ", I think "In my day, we just used regular Lego and they were just fine for us." This Augmented Reality concept basically allows you to put fake, computer generated Lego guns and a HUD around your Lego minifigs and have a battle with them. 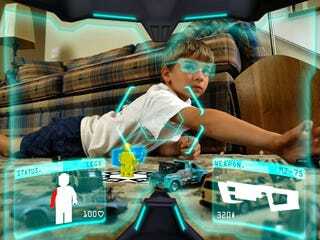 - Each player is equipped with a toy standing on a base and Augmented Reality glasses (Head mounted display). - Before the game begins, players can equip their respective toy with different capacities (health, shield, camouflage, weapons) on a limited number. - Then, players can prepare together the battlefield (game space) with real objects. - Both players start on both sides of the battlefield and the party can now begin. - The game is turn-based, players play successively in a limited time. - They can alternately move, attack, heal, use stealth, protect themselves with shields, switch weapons etc. - Each weapon has a specific range of distance and a special power. - Real obstacles can obstruct the field of vision allowing players to hide themselves. - The goal is to kill his opponent by strategically using all possibilities of game.